Are the slides that make up your eLearning lessons text-heavy? 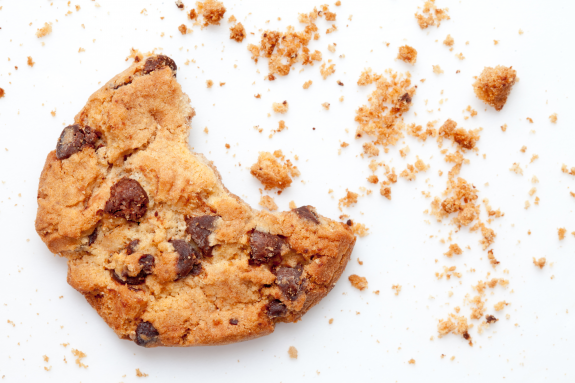 Images are an often overlooked component of a good eLearning course. 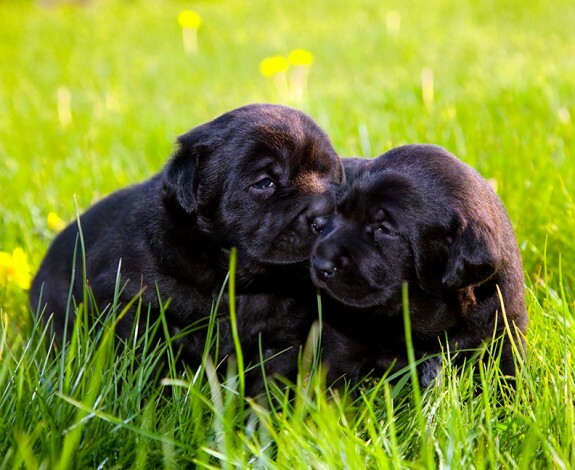 Sadly, when images are added to eLearning, they often have little to do with the content being presented or, just as sad, are of poor quality. You've probably heard the saying that a picture is worth 1,000 words. But consider this: people process information presented in an image far faster than text. According to Mike Parkinson, founder of Billion Dollar Graphics, "visuals are processed 60,000 times faster than text, graphics quickly affect our emotions, and our emotions greatly affect our decision-making." Parkinson went on to say "Study after study, experiment after experiment, has proven that graphics have immense influence over the audience's perception of the subject matter and, by association, the presenter (the person, place, or thing most associated with the graphic) because of these neurological and evolutionary factors. The audience's understanding of the presented material, opinion of the presented material and the presenter, and their emotional state are crucial factors in any decision they will make. Without a doubt, graphics greatly influence an audience's decisions." There's something very helpful about having a pictorial representation of the concept to hang your hat on. An image anchors a concept in a way that words often can't. While text forces you to create an image in your brain from scratch, introducing a picture gives us a jumping-off point, showing us a tangible concept which can be instantly grasped and further explored through text or audio. For many of the same reasons above, a good image can also increase a learner's comprehension and recall. Instead of trying to remember the nebulous image that they produced in their mind's eye, they can simply call up the more tangible picture that they physically saw and didn't have to manufacture themselves. Any journalist worth their salt will tell you that a story without a picture lacks the punch it might otherwise have. For instance, if I were to describe to you a natural disaster that occurred in some foreign country, you might be pretty shocked by the words alone. However, it wouldn't be quite as real to you as if I included a picture of the rubble, injured people, and all-around devastation. ... and it breaks the monotony of a text-heavy lesson. Looking to learn to create your own eLearning? We offer several live, online classes that'll get you up and running in no time. Classes range from 3-hour mini courses to full-day, multi-day events. 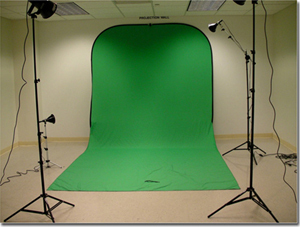 In the previous installment of this series, we provided a purchasing "checklist" for setting up a green screen video production studio. Part III of this tutorial series explains the production steps for recording, editing, processing and encoding video for use in Adobe Captivate eLearning lessons. Step 1: Develop a detailed script that not only describes what the talent will say, but also what they will do while on screen. Be sure to include how the talent will enter and exit the screen and what non-verbal gestures should be performed. Step 2: Set up the studio in a room that allows all equipment to be operated properly and still allows production staff to be comfortable. In this step, the critical production factor is the lighting. The lights should be positioned so the talent is evenly lit and the solid green background is free from any shadows and also lit evenly. The talent should be positioned as far away from the background as possible, while still providing the desired frame for the video. This reduces shadows and greatly improves the quality of the end product. Step 3: Establish and test the video recorder's settings for optimal performance. For audio, make the appropriate connections with the wireless microphone system and ensure the audio levels are within an acceptable range. Next, set the camcorder's recording sessions to record the video at 720p at 60fps (frames per second). Record the talent performing the script several times. Step 4: Import the video into Adobe Premiere CS4 for editing and processing. To begin, trim the video so it starts and stops at the desired locations. Apply the Boris FX chroma key filter to the video by activating the plug-in and choosing the background color you would like to remove with the plug-in's color picker. Adjust the chroma key filter so all the background color is removed and the transparent background is free of any processing artifacts. You may find that having a still image of the Captivate lesson's interface placed behind the video will help with adjusting the video's settings and placement. Step 5: Encode the processed video by selecting File > Export > Media. This will open a dialog box for setting the encoding parameters. Encode the video content as Flash Video (.FLV) and select the option to encode the alpha layer. This allows the background color that is removed by the chroma key plug-in to remain transparent. 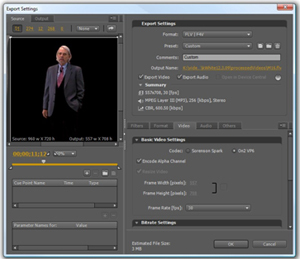 After choosing the encoding settings and clicking the OK button the Adobe Media Encoder (packaged with Adobe Premiere CS4) will launch automatically. Select Start Que to begin the encoding process. Once this process is complete, you have a video in .FLV format where the background has been removed, leaving just the talent. This video can be used in a variety of ways to support and enhance the instructional value of eLearning lessons. About the authors: John Gillmore is an Instructional Technologist with the University of Oklahoma's Center for Professional and Distance Education (CPDE). In this role, John researches, analyzes and evaluates new technologies for potential applications in instruction; promotes the implementation of technological innovations; creates demonstrations of instructional applications of technologies; and provides assistance to faculty, staff and administrators who have instructional technology needs. In addition, John teaches freshman information systems courses at UCO. John has a B.S. in Business Information Systems from the University of Phoenix and an MBA from UCO. Bucky Dodd is an instructional designer at the Center for Professional and Distance Education at the University of Central Oklahoma. His professional interests include innovation in eLearning, workplace learning and performance trends, and instructional design. Mr. Dodd has instructional design and consulting experience in both public and private organizations. He holds a B.A. in Corporate Communication and a M.Ed. in Adult Education from the University of Central Oklahoma. The ability to create Responsive Projects was introduced last June with the arrival of Adobe Captivate 8. During the development process, you can basically create and work on multiple screen sizes (called break points) in one Captivate project. When you publish the responsive project, the learner will automatically be served the break point appropriate for the device they're using. As I've created more and more Responsive Projects, one of the big concerns is to ensure the fonts and font sizes used in each break point is appropriate for the display size. For instance, I might want my font size to be 14 points in my Primary Break Point, 12 points in my Tablet Break Point, and a bit smaller in my Mobile Break Point. While I could manually change the font formatting used on my slides, Break Point by Break Point, if I've got a lot of slides, that means I've got a ton of work to do. 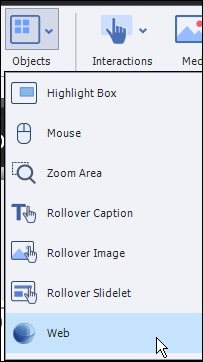 As an alternative to manually formatting the slide objects, visit the Object Style Manager (via the Edit menu). 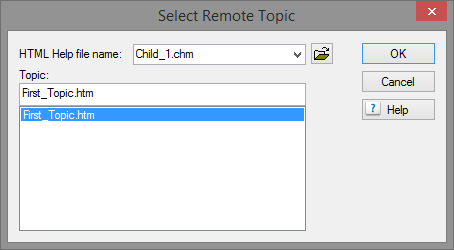 Select an Object Style and in the Text Format area, notice that there's a Break Points drop-down menu. The menu contains three options: Primary,Tablet, and Mobile. 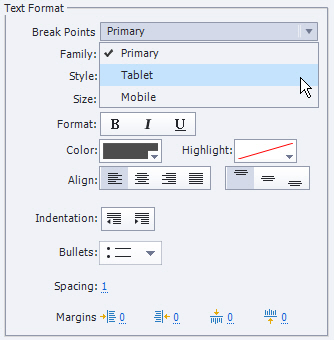 Select each Break Point in turn and set the desired Font Family, Size, Format, Color, etc. 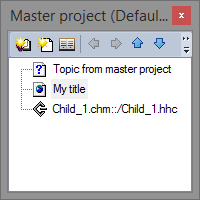 When finished, click the OK button and you'll see your changes immediately on the project's three Break Points. 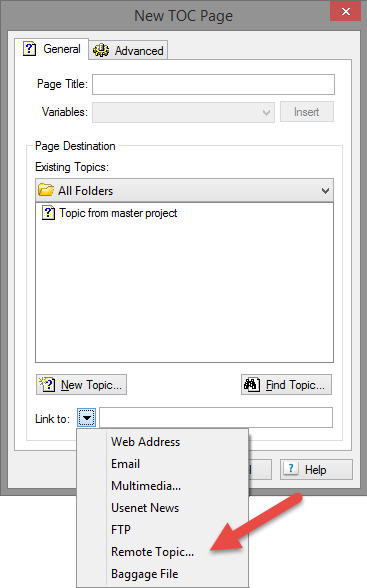 You're developing an eLearning module in Adobe Captivate or Articulate Storyline. There's a slide that plays for 45 seconds. As you're listening to the audio, you'd like a screen object to appear in sync with the voiceover audio or some other screen action. If the object in question is already on the slide, you can certainly select the object on the Timeline and drag it until its left edge gets to the desired part of the Timeline. Of course, if the slide is playing for a significant amount of time, that's going to require a lot of dragging. One technique that I use when I want to match screen actions to voiceover audio is called Sync with Playhead (in Captivate) or Align with Playhead (in Storyline). In the image below, I've positioned the Captivate Playhead on the Timeline by clicking at the top of the Timeline. The technique is identical in Storyline (except as you'll see in the image below, the Playhead looks a bit different). On the Timeline in either program, I can then right-click an object that I'd like to automatically move to the Playhead position and choose Sync with Playhead (Captivate) or Align with Playhead (Storyline). 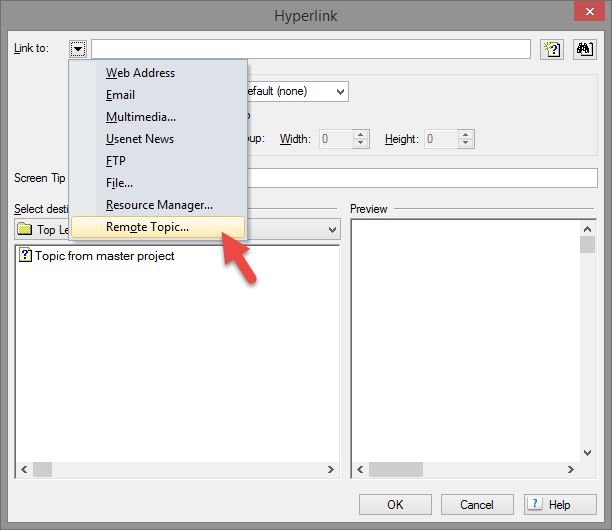 Over the past few weeks I've taught you about text hyperlinks and object hyperlinks. 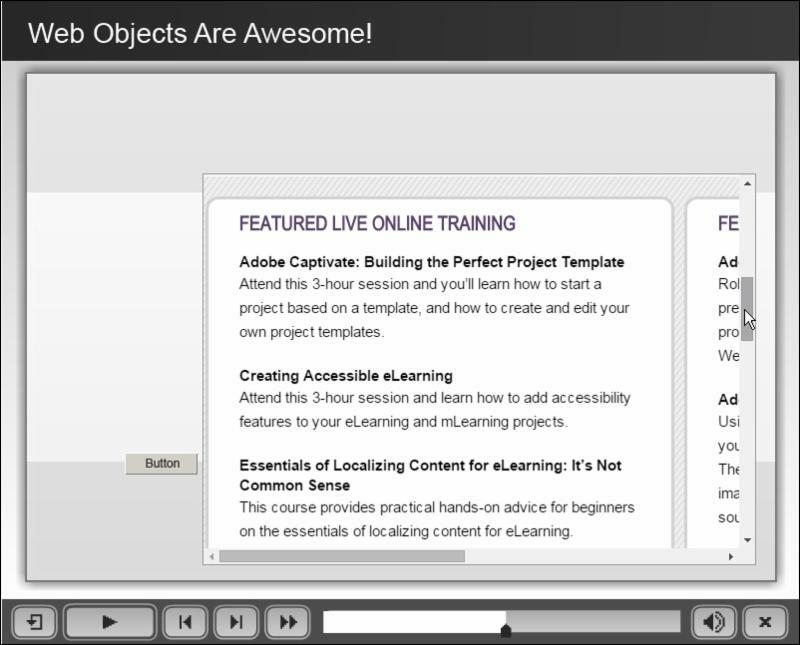 This week, let's dive into yet another way you can get your learners to a website: Web objects. While both text and object hyperlinks will take the learner to a website, the resulting website will either appear in a new browser window/tab, or replace the lesson completely. In the case of the latter, the learner will need click the browser's Back button to get back to the lesson. 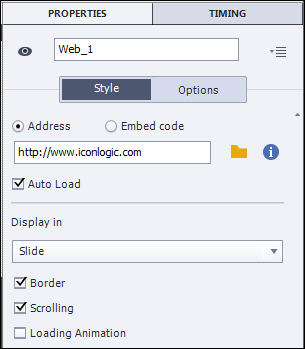 To add a Web object to a slide, click Objects and choose Web. With the object selected, visit the Properties inspector. You can add a Web address (just like any hyperlink). In the image below, notice that there is an Embed code option. You'll find the ability to Embed code particularly useful if you want to control the size of the window when it appears on the slide or its relative position onscreen. You have the ability to Auto Load the website and control whether the website appears on the Slide (which is the default) or in a new browser window. And you can add a border to the object, allow the learner to scroll through the website, and add a Loading Animation (useful if the target website is large and is going to take some time to download). In the image below, a web address has been added to the Address area. 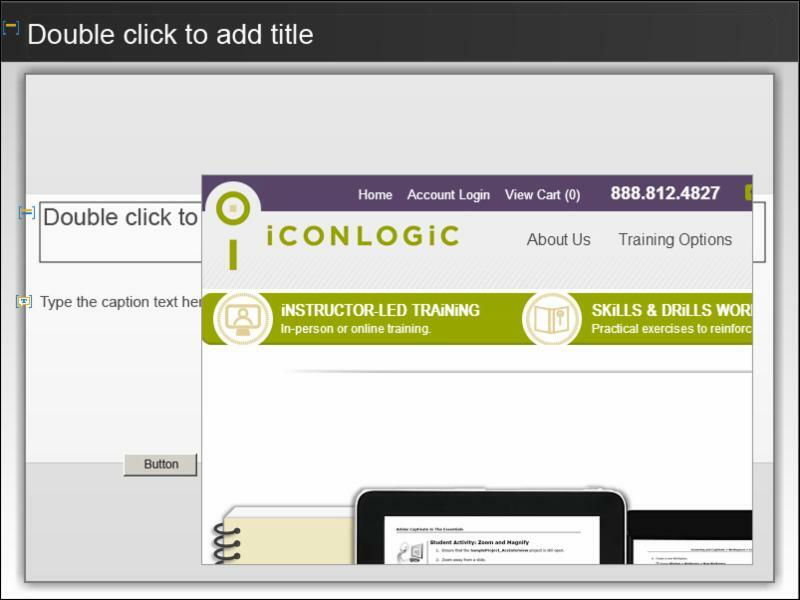 Notice that it appears directly on the Captivate slide (there's no need to preview in a Web browser first). In the image below, check out how the web browser displays the website (and I was able to scroll around the website). What are you doing Saturday? Are you going to build something? A storage shed perhaps? A deck? Face it, there's no way you'll finish either of those projects tomorrow. If you want to build something that matters, and get it done in a day, why not focus on your LinkedIn Profile? 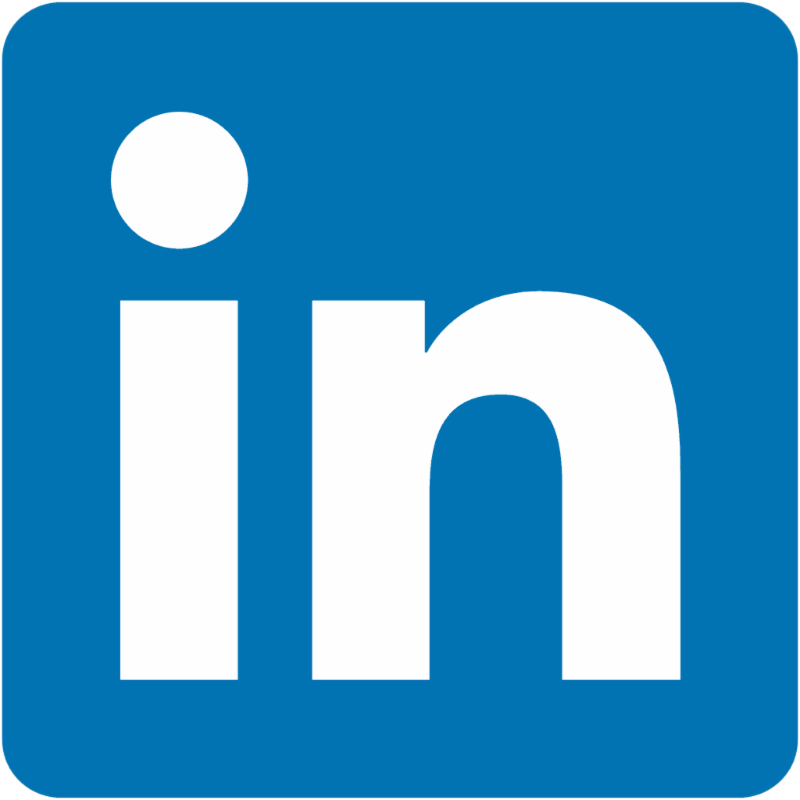 Whether you are in the market for a new job, just starting your career, or are a well-established professional, LinkedIn is one of the most important tools for establishing your online presence. Good practices from the start help you to "brand" yourself & determine what kind of message you want to offer about yourself to the world. The class will use a series of worksheets (provided) for exercises in gathering keywords, writing your summary, and listing your skills and strengths. We'll do some fun group exercises to get everyone thinking of how to improve their own profile.